One of the world’s most accomplished and respected designers, Marc Newson has designs all over the world. His work can be seen in major permanent museum collections including Museum of Modern Art in New York, London’s Design Museum, Centre Georges Pompidou, and the Vitra Design Museum. He has many accomplishments to his name, including being appointed Commander of the Order of the British Empire (CBE) by the Queen. TASCHEN is a worldwide art publisher founded in 1980 that specializes in books on art, architecture, design, fashion, film and travel. Prices ranging from very affordable to extremely expensive, TASCHEN has books and collections that range in topics for almost everyone. In 2012, Marc Newson and publishing house TASCHEN released “Marc Newson: Works,” which catalogue all of Newson’s works to date. The 610-page comprehensive book is estimated to showcase 95% of all the work Marc Newson’s done in his lifetime. His works are listed in chronological order and put together by category, which include furniture, objects, timepieces, jewelry, photos, cars, sketches and other items. The book also includes an in-depth interview with Marc Newson that Gagosian gallery Director Louise Neri conducted. The pieces featured include early pieces like the Lockheed Lounge and other objects like the Jaeger-LeCoultre Atmos clock. The futuristic metal lounger sold for over a million dollars at an auction at Phillips de Pury & Co. 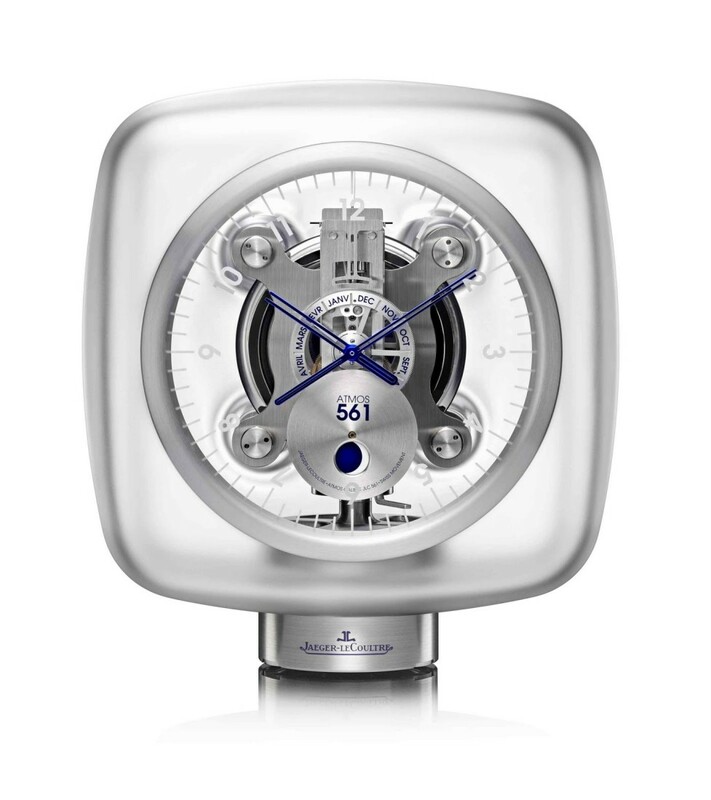 The Jaeger-LeCoultre ATMOS clock was initially created in 1938 and the ATMOS clock 551 and 566 are part of Marc Newson’s legendary design, which are shown in the TASCHEN publication. The world’s only clock movement that runs on thin air and without any need of human intervention for years, the ATMOS clock eightieth birthday in 2008 was celebrated by the creation of Atmos 561. 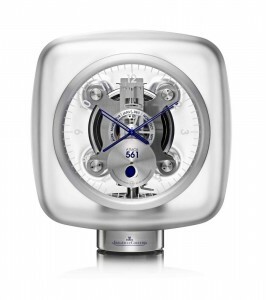 This clock is suspended in a bubble block of Baccarat crystal and is designed by Marc Newson. This limited series and eightieth anniversary Atmos was followed two years later by the Calibre 566, which Marc Newson also designed. 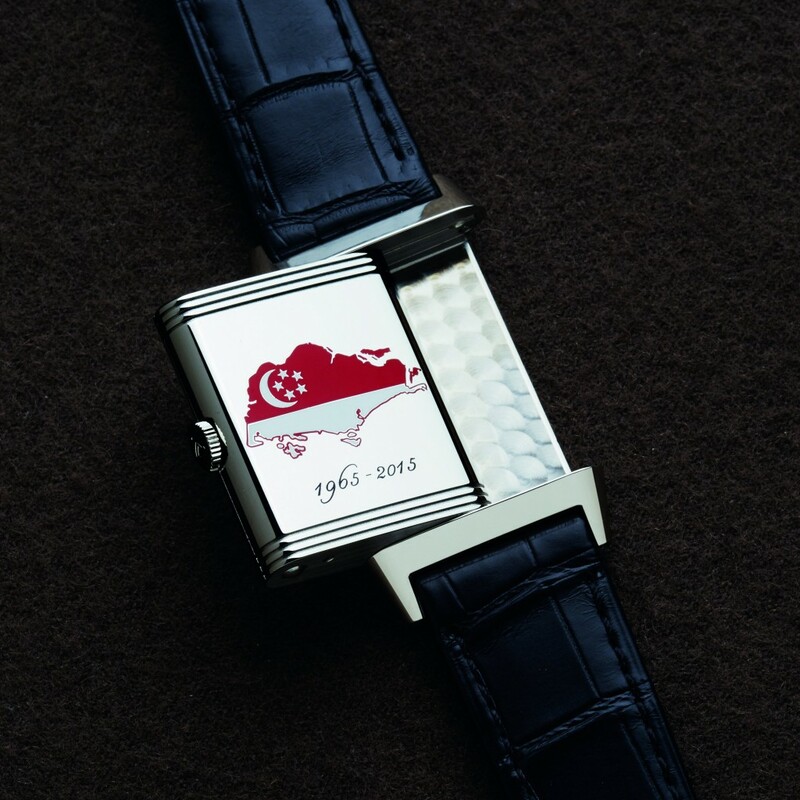 The Atmos 566 is limited to 76 pieces and made from clear or blue Baccarat crystal and also displays a current sky map. Newson is a big fan of the Atmos, and it is no surprise that he approached the company for collaboration. If you are looking for comprehensive guide for Marc Newson’s works, this over 600-page book is a must have. It features an in-depth case studies into some of his famous works while celebrating all he has accomplished. Jaeger-LeCoultre’s Duomètre Sphérotourbillon received an award in the “Best Horological Value” category at the 6th annual SIAR (Salón Internacional Alta Relojería) fine watch fair in Mexico City. Jaeger-LeCoultre packed up the best of its historical watches for exhibit at the SIAR fine watch fair in Mexico City. 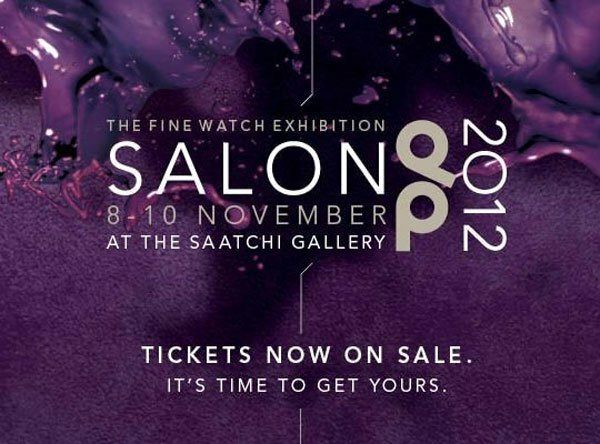 SIAR welcomed over 2,600 visitors and approximately 400 journalists for its 6th year of fine watch exhibition. 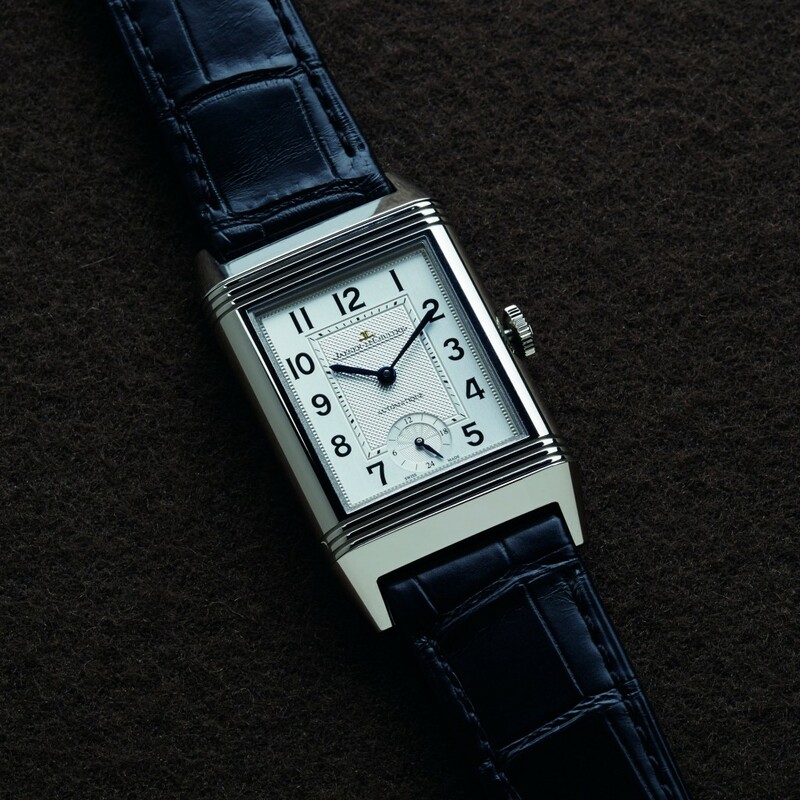 Jaeger-LeCoultre displayed some of its most classical time honored timepieces of which included its original 1931 Reverso, the Reverso Gyrotourbillon, Reverso à Triptyque, Grande Tradition Grande Complications, Memovox, Futurmatic models, pocket watches and of course its new Duomètre Sphérotourbillon. 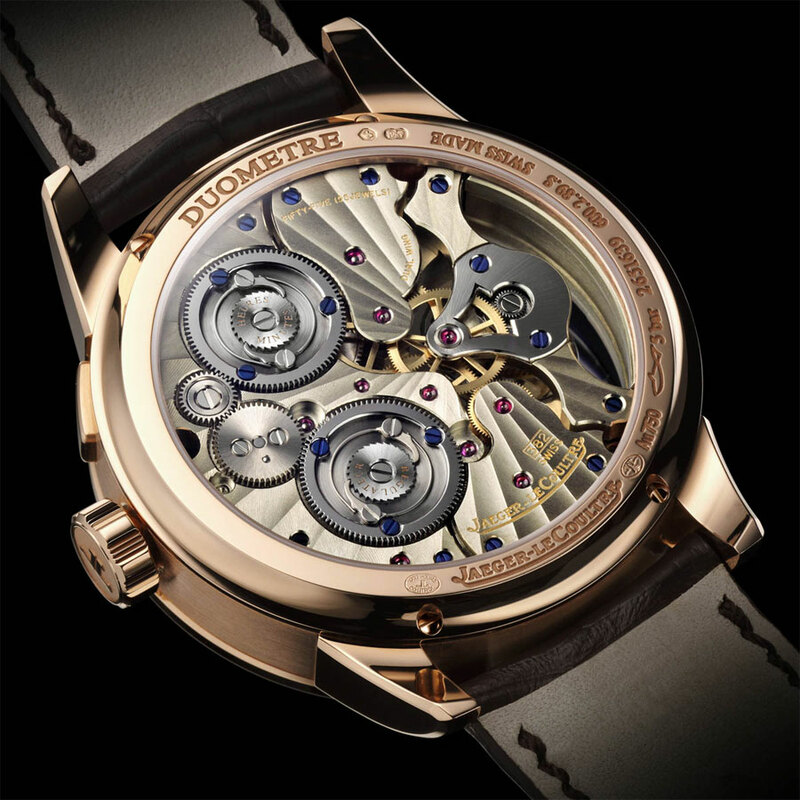 The Duomètre Sphérotourbillon timepiece is based on Jaeger-LeCoultre’s unique revolutionary Dual-Wing concept line. Jaeger-LeCoultre premiered Duomètre à Chronographe in 2007, a spectacular timepiece equipped with two gear trains – one of which is dedicated to the hours and minutes function and the other to the chronograph, with functionality of measuring down to a 1/6th of a second. This phenomenal timepiece gave way to the introduction of the Duomètre Dual-Wing line, designed by Master Watchmaker Christian Laurent, which garnered much attention for its two distinct mechanisms (in effect two brains) housed under one case – notable for its enhanced watch accuracy. 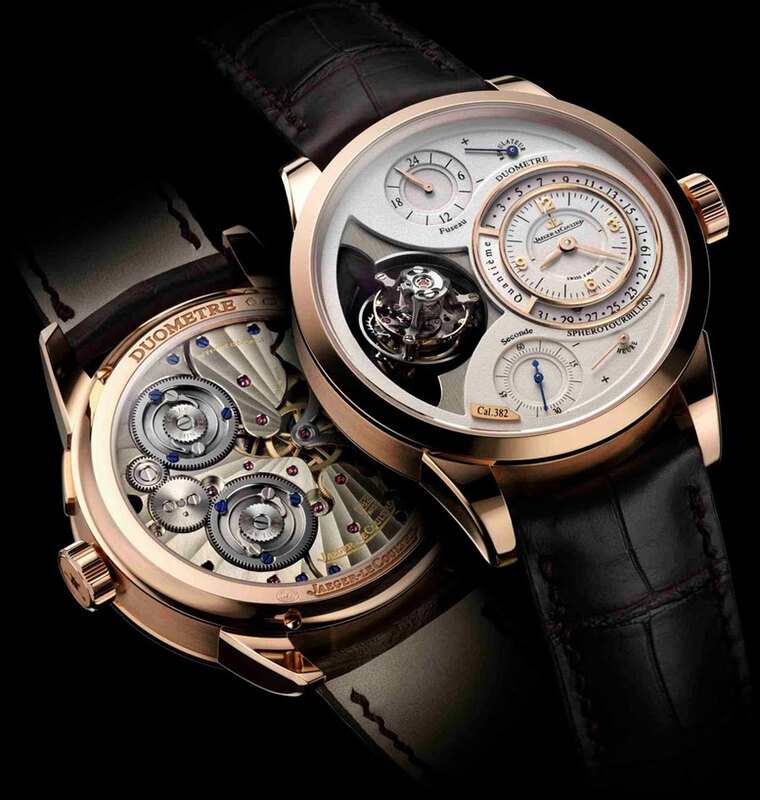 Jaeger-LeCoultre Duomètre Sphérotourbillon has evolved the revolutionary Duomètre Dual-Wing line into the 21st century. Duomètre Sphérotourbillon is the first watch to possess a multi-axis tourbillon to provide accuracy that presents time with distinct precision in part to a small seconds hand equipped with a flying set return. This flying set return allows the watch to be adjusted to a precise instance of time. 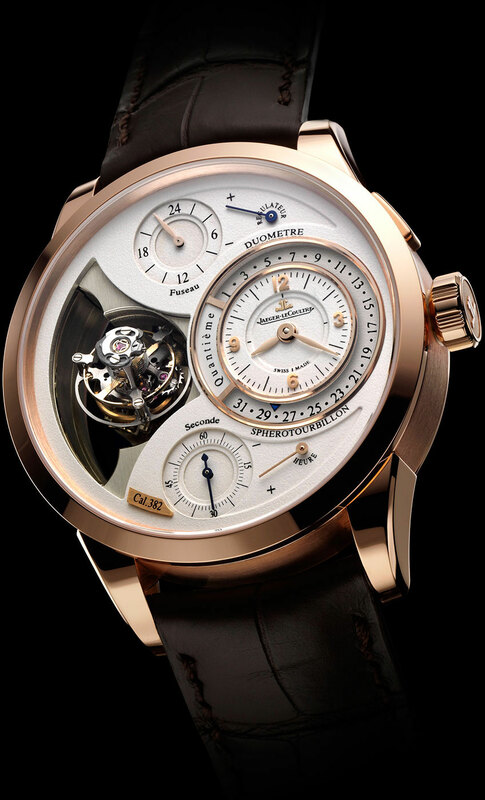 Duomètre Sphérotourbillon houses two axes which compensates for the effects of earth’s gravity regardless of the positions in which the watch may be held; and is also equipped with cylindrical spiral. Distinct characteristics of the Duomètre Sphérotourbillon include its independent seconds displayed at 6 o’clock on the watch dial and its capability to be reset to zero by pressing a push-piece at any time without interrupting the tourbillon. Duomètre Sphérotourbillon’s visual open case-back reveals JLC’s new 382 Calibre movement, its untreated German silver bridges and plate which bears JLC’s exclusive “c?tes soleillées” decoration. 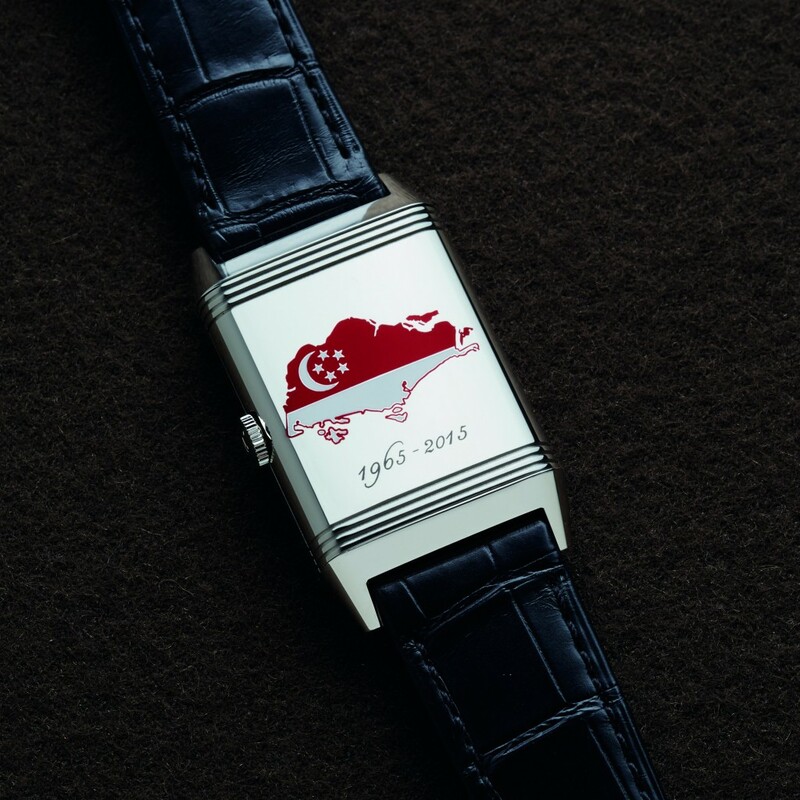 The crown also bears Jaeger-LeCoultre signature logo. The “Best Horological Value” awarded to Duomètre Sphérotourbillon adds to its aesthetic appeal and speaks volumes of its grand complication and technical performance, which is exemplary of JLC’s long standing watchmaking tradition. Congratulations Jaeger-LeCoultre for your amazing Duomètre Sphérotourbillon timepiece achievement and your SIAR reward.